(CNN) -- Pace bowler James Anderson helped bowl West Indies out for 310 -- and they still need 144 more runs to make England bat again with only seven wickets standing -- by stumps on day four of the second Test match at Riverside, Durham. 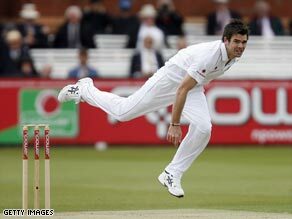 James Anderson's sixth five-wicket Test haul forced West Indies to follow on at Riverside. Anderson's sixth five-wicket Test haul allowed England to enforce the follow-on and the Windies then reached 115 for three at their second attempt -- on the back of a quick-fire half-century from captain Chris Gayle. However, the match will almost certainly result in the hosts regaining the Wisden Trophy, either 1-0 or 2-0, after their first Test victory at Lord's. West Indies' first-innings resistance came primarily from Ramnaresh Sarwan (100) and Denesh Ramdin (55), as well as some tail-end impudence from Sulieman Benn. But Anderson (five for 87) stuck largely to his task and prevailed in the end with some well-directed pace and occasional swing. Sarwan's fourth hundred in seven Tests against these opponents was another sturdy effort, but the tourists needed him to dig in again to keep England at bay. Anderson and his fellow-seamers Stuart Broad and Graham Onions shared the wickets -- with one run-out -- after the Windies had resumed this morning on 94 for three. When the tourists batted again, Gayle (54) blazed his way to a 39-ball half-century which included six fours and two sixes. Howewer, Durham seamer Graham Onions took two wickets in just three balls to put his team back on course for victory by the close of play.